Oliver Speidel had held on to the top spot in the POY rankings since the middle of March until this week, when two of the race’s top contenders made the final three of an absolutely huge $5,000 no-limit hold’em event at the WSOP. A total of 1,001 players entered the event, building a massive $4,704,700 prize pool. The leader for much of the late going was none other than Dan Smith, who had already made five final tables and won four titles, three of them in $5,000 buy-in events. Smith looked to be on track to become the king of the $5k in 2012, but ultimately fell short in third place for $368,943 and 1,280 POY points. As a result of this score, Smith moved into second place in the standings. With Smith out, Kyle Julius went heads-up with two-time bracelet winner Panayote Vilandos. In the end, Vilandos won out, earning $952,694 and 1,920 POY points and moving into 22nd place as a result of winning his third WSOP title. For second place Julius earned $589,687 and 1,600 POY points, catapulting him into the top spot. Julius has now finished runner-up in two of the year’s toughest large fields. Julius previously fell just short of the PokerStars Caribbean Adventure main event title, finishing second of 1,072 entrant for $1.5 million. He has now made three final tables, compiling year-to-date earnings of $2,103,282. 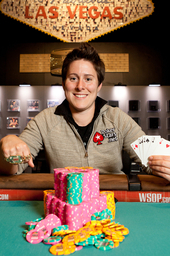 Vanessa Selbst came into contention in the POY race when she won her second WSOP gold bracelet, taking down the $2,500 10-game mix for $244,259 and 1,080 points. Selbst is only the second female player in history to win two open events at the WSOP, with the first being Jennifer Harman. Selbst had previously won a $5,000 no-limit hold’em prelim at the L.A. Poker Classic and final tabled one of the early events at the Series, finishing fourth. As a result, she has moved into a tie for 17th place in the standings with Brendon Rubie. This will be the third straight year that Selbst has been in contention in the POY race, finishing 4th in 2010 and 20th in 2011, all while only playing tournaments part time due to attending law school at Yale. She graduated this year. Michael “The Grinder” Mizrachi has won the WSOP $50,000 buy-in Poker Players Championship eight-game mix for the second time. The event has been around for just seven years. 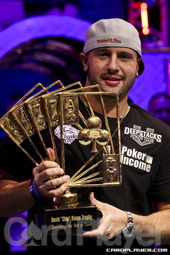 Mizrachi defeated Chris Klodnicki heads-up to become the first player ever to win this prestigious title twice. Mizrachi topped a tough field of 108 to earn $1,451,527 and 1,020 POY points, moving him into 13th place on the leaderboard. For capturing his 21st career title, “The Grinder” increased his lifetime live tournament earnings to $13,883,621. This was Mizrachi’s fourth final table finish of 2012, including a fourth place finish in the $25,000 World Poker Tour Championship main event, and fourth and fifth place finishes at the WSOP before taking down this huge and prestigious $50,000 title. The player with the most final tables so far in the POY race is Joe Kuether, who made his ninth in a $1,000 no-limit event this week at the WSOP. 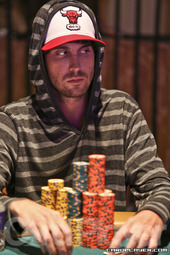 Kuether eventually finished third out of 3,221 entrants, earning $218,983 and 800 POY points. The Wisconsin native has captured three titles this year, earning a total of $491,587 and moving into a tie for tenth place in the overall standings with Faraz Jaka.